Chop the walnuts, garlic and capers. Heat a little oil (but not frying) and add what you have chopped, adding also the olive pâté. Mix well, then add the soy milk a little at a time. Continue to stir until boil, then cook over low heat for about 20-30 minutes. Towards the end of cooking also unite the cream, making sure to mix well with other ingredients. 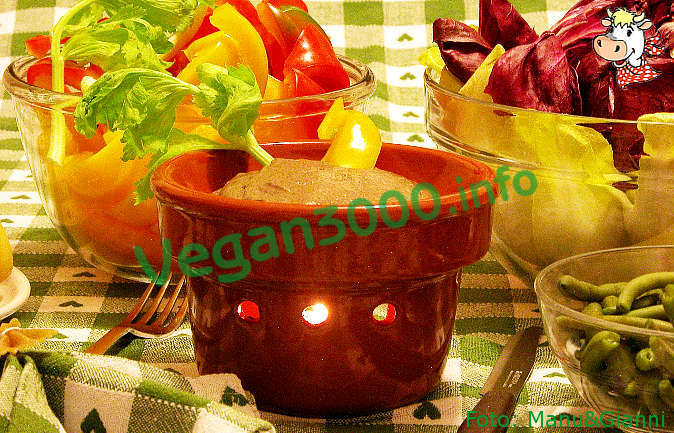 Turn off the heat and serve, in the appropriate individual bowls with food warmer, along with vegetables (e.g. peppers, celery, radish, cabbage, carrots, potatoes, etc.). The bagna cauda is a Piedmontese dish and the one proposed is adapted from the traditional version employing anchovies. Io eviterei i capperi ed eventualmente aggiungerei o un peperone giallo o dei topinambur. Gli altri ingredienti sono perfetti.